Jim Anderson, owner of Time And Again clock shop in Waterford, grew up in southeastern Connecticut and lived here for many years before moving away for a time because of work. He returned in 2014, and was looking for a volunteer opportunity, when he noticed that the tower clock in the Museum’s Greenmanville Church didn’t work. Anderson met with Paul O’Pecko, vice president of research collections and director of the G.W. Blunt White Library, and offered his expertise and his services to get the four clock faces running and the bells chiming again. The Greenmanville Church dates to 1851, although its original location was down Greenmanville Avenue (adjacent to the Museum’s South Entrance). It was moved to its current location on the McGraw Quadrangle in 1954 after it was acquired by Mystic Seaport in 1951. The original steeple had no clocks and had been broken up in 1902. It was about 3 feet shorter than the present one, which was built by the Museum in 1954 after the building’s relocation. The clock was built in 1857 by the Howard Clock Company of Waltham, Mass. for a New England college. It had been in storage since 1931, and not maintained. 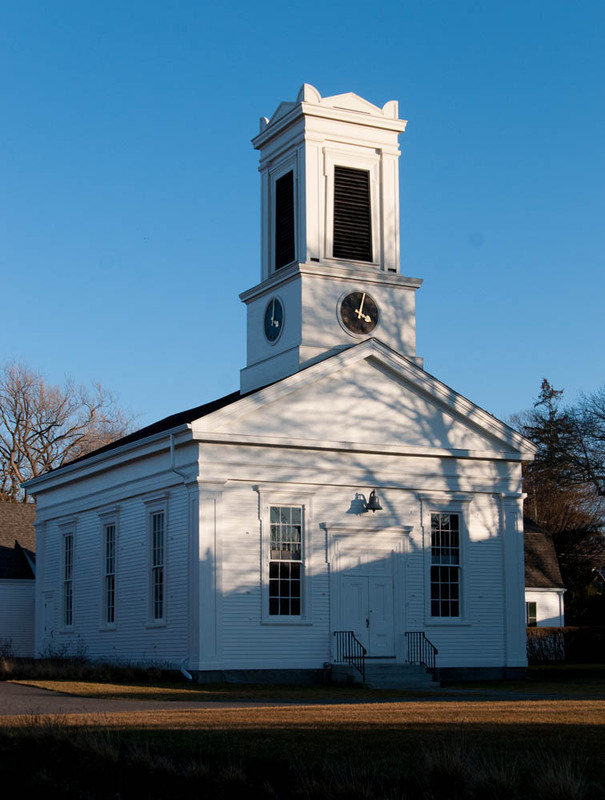 It was sent to Mystic Seaport and the steeple was modified to accommodate the four clock faces. When the clock was installed in the church, the decision was made to showcase the mechanics as much as possible to fit in with the Museum’s mission. The movement was located in the southwest corner of the first floor, with the strike weights and pendulum in the basement, and a fairly circuitous transmission system to carry the time output from the movement to the tower located some two stories above. It worked for several decades, looked after by the late Frank Murphy and then the late Don Treworgy, director of the Planetarium. As time went by, one face after another stopped working until only one was left. After both Murphy and Treworgy passed away, maintenance fell by the wayside. It has been completely stopped for about seven years. The church at its present location on the McGraw Gallery Quadrangle. O’Pecko brought together Anderson and volunteer Bill Michael, a mechanical engineer, and they worked on the project for about 15 months. Anderson estimates he put in about 120 hours. When he first got inside the clock, Anderson said he tested the pendulum and realized right away there was not enough power to keep the pendulum swinging. Throughout the mechanisms, Anderson discovered loose screws, lots of dirt and dust, worn gears and bushings. “As we got deeper and deeper into the clock, we decided we needed to really do the whole thing so that no one will have to touch it again for many years,” Anderson said. So they took apart the whole clock and hand cleaned it section by section, every widget, every gear, every bushing, every nut and bolt. Then they rebuilt it, making some improvements along the way to ensure smooth operation and proper synchronization moving forward. On January 12, they restarted it and it once again began telling time and chiming the hours. The clock remains a work in progress, as adjustments continue to be needed. In the first week, it stopped twice and after troubleshooting they decided to detach the East-side clock (facing Greenmanville Avenue) because of problems within the mechanisms. That will be fixed when the opportunity arises for the hands to be removed from the outside (which will require a cherry picker). Posted in News on February 15, 2017.